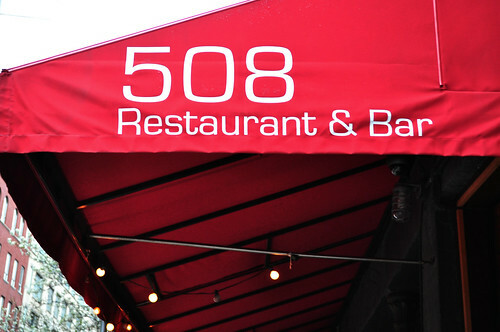 508 was opened by husband-and-wife chef couple, Anderson Sant'anna de Lima and Jennifer Hill. The menu is comprised of "an extensive lineup" of small plates (including dishes inspired by Middle Eastern to Catalan cuisine), housemade pastas, and simple entrées "with inventive accents at this eclectic, date-worthy spot." The bar area at 508, which offers daily happy hour specials (e.g., $6 sangria, $5 well drinks, $1 oysters on a half shell, etc.). The bartender also makes a collection of delicious cocktails appealing to all types of palates. I had a glass of the red house sangria, while Lisa had a strawberry basil caipirnha with Lebon cachaca, strawberry, basil, and lime. My sangria was pretty good -- a little bit on the watered down side -- while Lisa's concoction was very well-executed in a fruity and herb-y way. 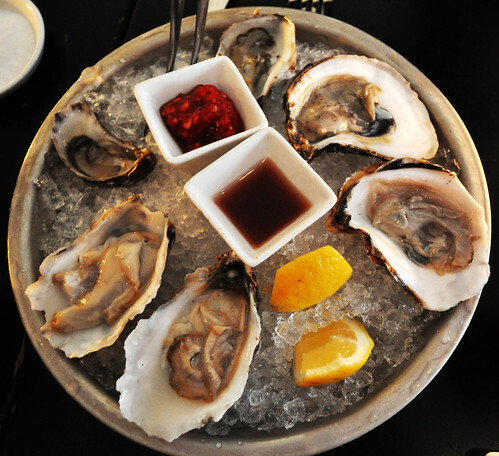 Lisa started with half dozen of oysters on a half shell from the restaurant's daily selection (including oysters from the East and West Coasts, e.g., Blue Point and Kishimoto). The oysters came with a hogwash-like vinegar, cocktail sauce, and fresh lemon. Lisa, a lover of these slurping bivalves, was a very happy camper upon having these. To start, we decided to get a few small plates as starters before our main courses. First up were the roasted duck empanadas with red pepper cilantro lemon sour cream. 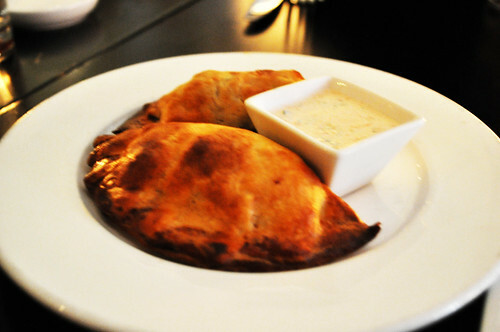 With a flaky and toasted pastry shell, the empanadas had a hot center of savory duck meat mixed with a zesty sauce. We really enjoyed these because it had a nice balance between puff pastry and meat. 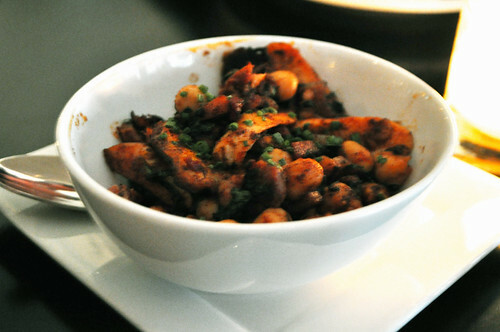 We also had the grilled octopus with garbanzo beans, dried apricots, pancetta, mint, olive oil, and smoked paprika. The octopus was evenly charred along its exterior (i.e., its skin and suction cups) which added a smoky flavor along with the paprika. The garbanzo beans and pancetta added interesting textural contrasts to the grilled octopus flesh. It was a good dish to pick at during the start of our dinner. Lisa and I couldn't live with ourselves without having tried 508's truffled mac 'n' cheese (plus, another one of Erin's insisted recommendations). There was an option to add lobster for an additional $10, but we decided to stay classic without it (there's always next time!). 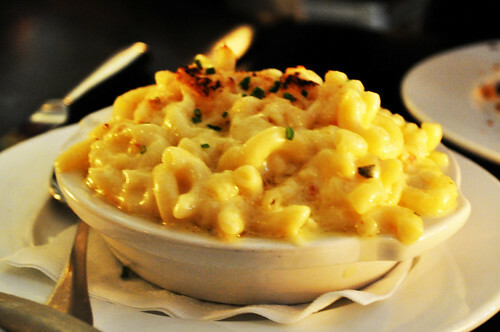 The scent alone from the mac 'n' cheese was so intensely aromatic that Lisa and I could only speculate how concentrated it would be on our tastebuds, especially for those umami receptors. OMG, this was quite possibly the best macaroni-and-cheese I've had (though the pan-fried version at Essex is pretty epic in its own right), but to be fair, the kitchen at 508 may have cheated a little bit (however, no arguments from us at all) -- along with some dark specks of black truffle, it was shamelessly doused in truffle oil, creating an orgasmic explosion of creamy deliciousness. 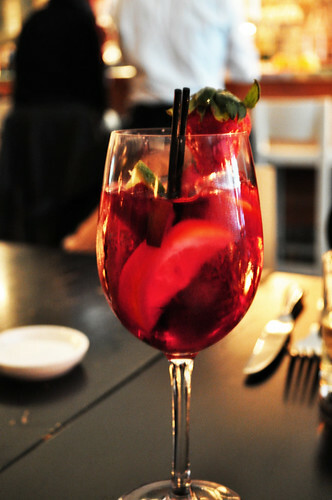 So if you happy to be at 508 for happy hour, drinks, or dinner, please do yourself a favor and order this for the table. You will undoubtedly be fighting over who will be the lucky person to savor the last morsels. As her main course, Lisa "lavender and lamb" with extra light gnocchi made with celery root, lamb, lavender leaves, English sweet peas, pea shoots, lemon zest, Asiago cheese, and chablis garlic cream. The best way I could describe the bite I stole from this course would be velvety and creamy. While it is a bit on the heavier side, for those that like lamb, this is the way to go. 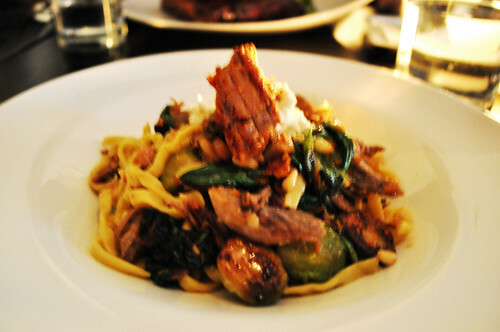 I had the roasted duck with pine nuts, spinach, Brussel sprouts, pancetta, and olive oil tossed with tagliatelle pasta. It may have been a little overkill to have ordered a pasta with duck given that we had already ordered the duck empanadas, but it looked too good to pass up. The duck had a crisp and toasty exterior (a result of its roasting), while the crunch from the pine nuts and the subtle bitterness from the Brussel sprouts gave the pasta an overall earthy touch to it. The pasta itself was a little bit disappointing for me, but I enjoyed the other elements very much. 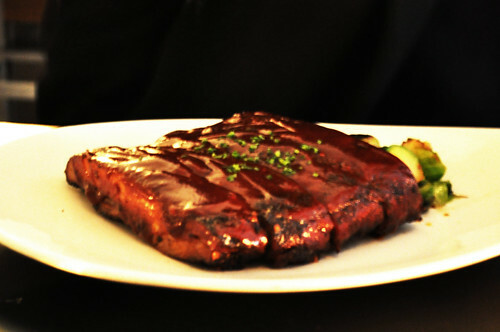 Marcus went with the slow smoked barbecue ribs with "508 spice blend" and barbecue sauce -- served with mac 'n' cheese and Brussel sprouts. It was a lot bigger than he was expecting, and given that we had ordered so many starters, he could only finish two and a half pieces. Still solid ribs, so I would recommend if you want to have these that you shouldn't stuff yourself up with too many starters. Do that, and you're golden. 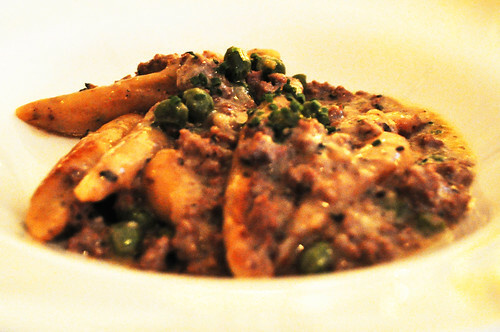 Findings: Overall, we really enjoyed our dining experience at 508 Restaurant & Bar. The menu is quite extensive, to the point where we partially suffered from what Marcus likes to call "choice paralysis" -- i.e., where everything sounds so delicious and appetizing that it "paralyzes" you from having the ability to choose only a few items to actually order. After pulling ourselves together, we were able to make some sound choices, resulting in a really solid meal. 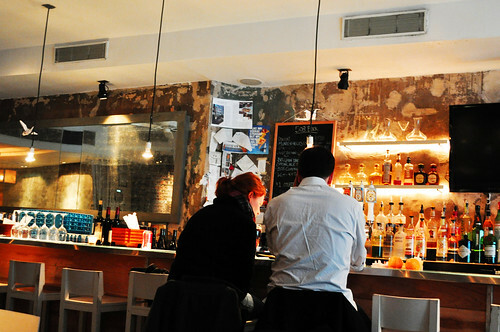 Along with really good gastrogrub, 508 has a knack for concocting some great cocktails to fit all drinker types. So with cocktail in hand, a chill ambiance, well-composed courses, and some relaxing company, you're bound to have a wonderful time at 508, whatever the occasion. Price point: $12-14 for each starter, $24-26 for each main course.